Sweet Senior! Rumble is a mid sized 73lb, friendly, brindle guy. He raced 9 races years ago at Jefferson County Kennel Club in Florida before they closed. DOB is 3/27/07 so he is a senior that qualifies for our reduced adoption fee of $250. He was adopted way back in 2009 out of our Tri County Tech program and has been in a home since then. HIs family is having to move in with their father to take care of him and will not be able to bring their 3 senior greyhounds with them. They are asking for our help rehoming all three of their dogs. Rumble is very laid back guy. He is a leaner and wants to be with people. He is very bonded with their 11 year old female named Leena and we would love to place them together if we can. We understand that finding someone to take two 11 year olds at the same time is not something that may be possible, so we will consider placing them separately too. 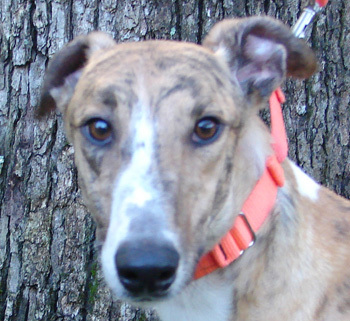 Their other 8 year old greyhound, Razor, would be fine being placed separately. All three dogs have the same sire Maryville Rumble. Rumble's dam is Regall Redrocket. The photos of Rumble were from when he first arrived. All three of the dogs have been living with cats. They have not lived with children but have been great with the kids they have met.